My biography of Virginia Hamilton is a finalist for an Ohioana Award. I am so honored! Back in October, I was invited to participate on a panel of middle-grade authors at the Ohio Educational Library Media Association conference in Columbus. The panel discussion was scheduled bright and early, 8 a.m. Instead of getting up at zero-dark thirty to drive down that morning, I had dinner with our son Ian the evening before and stayed over with my friend Barbara Sears, former State House representative. After dinner we joined up with neighbors, and I met Laura Battocletti, the director of the Statehouse. Yes, the Statehouse in Columbus, the one with the big cupola, and the beautiful rotunda with its dazzling skylight, restored through a penny-collecting campaign with schoolchildren from Ohio. Barbara, taking on her new role as my publicity agent, shared my latest book, a biography of children’s literature icon, Virginia Hamilton, with Laura. Virginia is the most honored children’s book author ever. Yet, there was one award she had not received. Laura asked if I was aware of the Great Ohioan award. 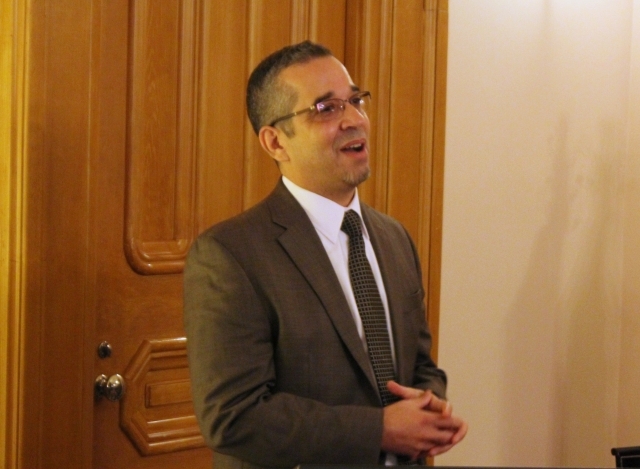 The award has been in existence since 2003, and given to individuals who have made a significant contribution to World, American or Ohio history by the Capitol Square Advisory Board. As we talked about Virginia’s accomplishments, including being the first African American woman to receive the Newbery Award, we agreed Virginia was an ideal candidate. Fast forward to several weeks later. While participating in the Cincinnati Book Festival, I met a young mother, Angie, and her daughter, fourth-grader, Annie. They were thrilled to learn that I had written a biography of Virginia. Annie wrote a report on Virginia several years before, based on her love for her stories. Angie knew Jaime Adoff, Virginia’s son, and Annie reached out to him as a resource for her paper. So, there I was at the book festival, looking at little Annie with her big brown eyes, filled with excitement as I personally signed my biography of Virginia to her. Angie and I exchanged contact info, promising to keep in touch. Several weeks later, I received an email from Laura, with a link to the Great Ohioan Award nomination form. I reviewed, submitted, and sent in my nomination of Virginia. And then I reached out to Angie, to see if perhaps she, or Annie, might want to send a letter to support my nomination. Of course, they would, Angie replied. Time passed, and I didn’t think much more about it. Until I received a note from Laura, advising me that Virginia was to be confirmed formally as a recipient of a Great Ohioan Award. 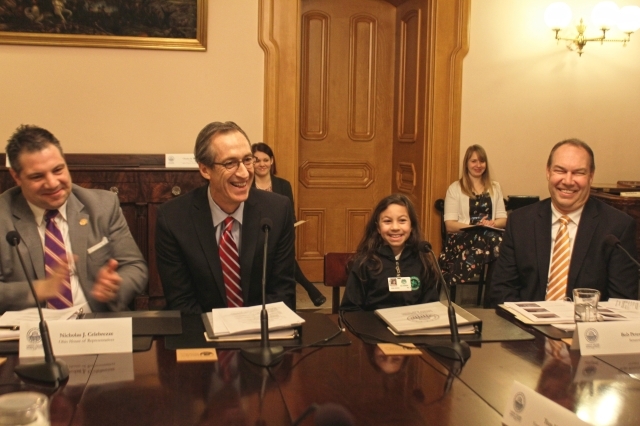 And, the board was so impressed by little ten-year-old Annie’s letter, that Annie and her class were to be bused to Columbus from Cincinnati for the confirmation, and given a private tour of the statehouse. How cool is that? I was sworn to secrecy until yesterday’s ceremonies, but I could not wait to tell Arnold Adoff, Virginia’s husband, and Jaime. Arnold could not attend the ceremonies for health reasons, but Jaime took a personal day from his teaching position at McKinney Middle School in Yellow Springs to join the momentous occasion. 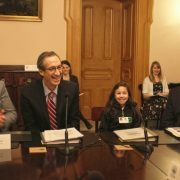 Annie, her parents and grandmother, her teacher, Jaime, and yours truly were ushered into the Capitol Square Foundation Board meeting. Annie was invited to sit beside Chair Charles Moses. Cool as a cucumber, Annie read a synopsis of her nomination, and in a glimpse of her future as a politician, finished with a joke. Yes, in front of the stoic, now smiling board members, since Virginia loved frogs, little Annie told a joke. I looked over at Angie, who was laughing and crying at the same time. We all were. 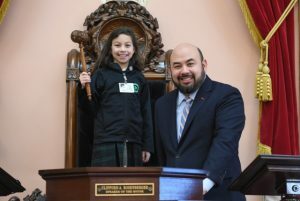 Speaker of the House Cliff Rosenberger introduced Jaime, who offered that of all the awards his mother had received, that she would be so honored by this recognition, as she was so proud of her home state, and much of her writings featured Ohio’s landscape. After the nomination was formally unanimously approved, the member’s eyes filled with appreciation, the meeting was adjourned. 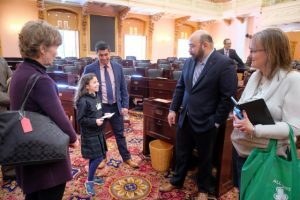 As if the process was not enough for Annie and all of us, her entourage, we were escorted to the House floor, where typically no one, outside of representatives, are allowed. Much less the Speaker’s chair. Yep, that’s Annie, with the Speaker, who lent his pin to her for the honor of overseeing official photos of the occasion. From there we were escorted through the Statehouse, Jaime, Angie and I sharing our amazement over the coincidences leading to the day. I shared over lunch that it was not lost on me that it was my forever fourth-grader, Claire, who as my guardian angel, may have had a hand in all of this. Claire’s assigned number, based on alphabetical order throughout her class years was #17. Ohio was the 17th state admitted to the Union. Claire loved books and sharing stories, and we’ve chosen to honor her through Claire’s Day. It was through Claire’s Day that my first book, a picture book about the state, Hidden Ohio, came to be. I loved writing for children, and hoped to have more books published. To accomplish this goal, I started attending Society of Children’s Book Writers and Illustrators conferences. It was at one of these conferences that I learned my friend, Michelle Houts, was writing and editing for a new series being published by Ohio University Press. Biographies for Young Readers features primarily Ohioans who have made their mark in the world. It was through Claire’s Day that I became aware of the Virginia Hamilton conference and came to know Jaime and Arnold, ultimately leading to writing Virginia’s biography for the series, and nominating her for the award. And then, reaching out to another little fourth grader to help honor Virginia. Coincidences or secrets of the universe whispering in our ears? I don’t know about you, but I’m going to keep listening. In honor of the late Virginia Hamilton, a GREAT OHIOAN.